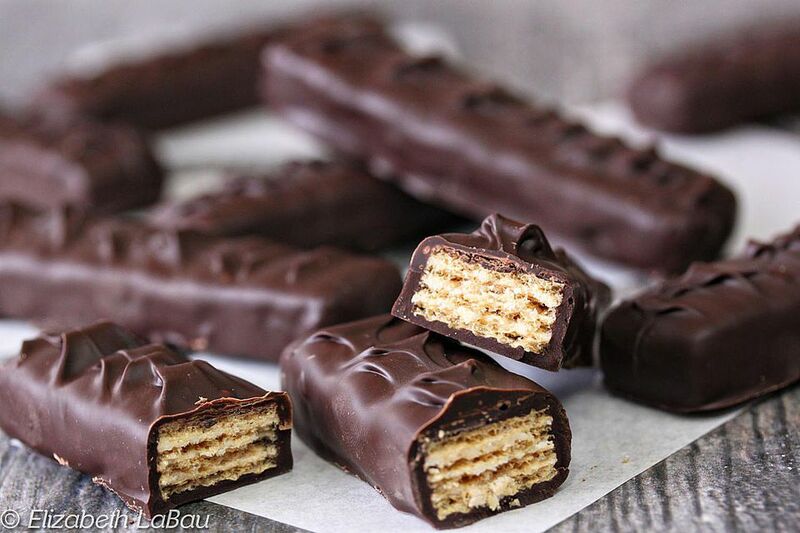 Kitty Cat Bars are a homemade take on Kit Kat Bars, You won't believe how easy it is to recreate these classic candy bars at home! You'll need just 2 ingredients to make these crunchy bars that have the signature wafer filling of Kit Kats, with a much fresher taste. Use your favorite flavor of wafers to really shake things up! 1. If you're using real semi-sweet chocolate, read the instructions on tempering below at #4. If you're using chocolate candy coating, place the coating in a microwave-safe bowl. Microwave in 30-second increments, stirring after every 30 seconds to prevent overheating. Heat and stir until the coating is smooth, melted, and free of lumps. 2. Cover a baking sheet with waxed paper or parchment paper. Using dipping tools or a fork, dunk a wafer into the melted coating so it's submerged completely. Remove it from the coating and let excess drip back into the bowl. Set it down on the prepared baking sheet. If you want to imprint a light pattern on the top, tap the top of the bar in short intervals with the tines of the fork while the chocolate is still wet. 3. Repeat until all of the wafer cookies are dipped. Refrigerate the tray to set the coating completely, for about 15 minutes. 4. If you want to use real semi-sweet chocolate, instead of chocolate coating, I highly recommend tempering the chocolate instead of simply melting it. You can learn more about tempering here. The main benefit is that the chocolate will be shiny, firm at room temperature, and have a nice "snap." If you don't want to temper it, you can simply use melted chocolate as described above. For untempered chocolate I recommend keeping your candies in the refrigerator until shortly before serving, to prevent the chocolate from getting soft or sticky at room temperature. 5. To use tempered chocolate, you will need a chocolate thermometer and 1 lb of chocolate that is in temper (I do not recommend using chocolate chips). Separate out about a quarter of your chocolate, and set it aside for now. Chop the remaining three-quarters of the chocolate into small pieces, and place them in a microwave-safe bowl. 6. Microwave the bowl of chopped chocolate in 30-second increments. Stir after every 30 seconds, and heat and stir until the chocolate is entirely melted and smooth. Insert a candy thermometer and make sure the chocolate is 115 F (46 C). If it's not, heat it for a few more seconds until it reaches this temperature. 7. Add the remaining chunk of chocolate to the bowl of melted chocolate, and stir gently to incorporate. Stir almost constantly to melt the big chunk. The warm chocolate will melt the chopped chocolate, and the newly added chocolate will bring down the temperature of the warm chocolate. 8. Continue to stir the chocolate while it cools, until it cools down to 90 F (32 C). Test the temper by smearing a bit of chocolate on a piece of parchment: within a few minutes it should start to set around the edges. If it's not tempered yet, let it cool for another degree or two and then test again. Once tempered, dip the wafers in the chocolate as described above. If it starts to get too thick to dip, heat it for just 5-6 seconds at a time, making sure the temperature does not rise above 90 F, to keep it in temper. Click Here to View All Candy Bar Recipes!